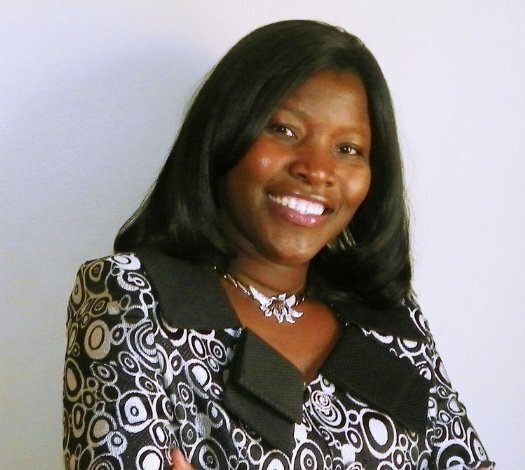 I am pleased to introduce Rali Macaulay to the Pray What God Says blog for a guest author interview. Rali is an international bestselling Christian author, with a desire to bring the lost to the Lord, empower believers, and strengthen their relationship with God through her writings. 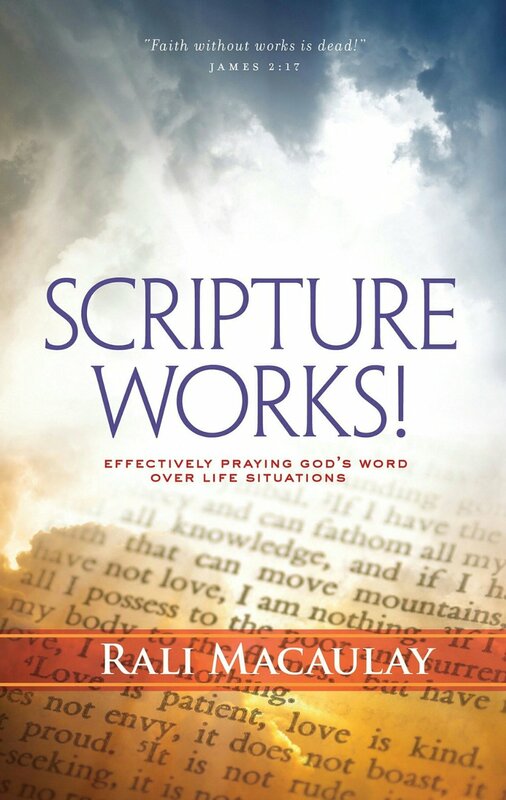 Earlier this year Rali’s debut book entitled “SCRIPTURE WORKS!” became a bestseller within days of its launching. She is passionate about the Word of God, and lives her life on the principles of God’s Word. PWGS: What is your book all about? RM: The full title, “SCRIPTURE WORKS! Effectively Praying God’s Word over Life Situations” is about prayer based on God’s Word, the Bible. RM: Many years ago, I started to pray with the scriptures; but then I would encounter similar situations in the future and completely forgot what scriptures I used in the past. As a result I would need to do my researches afresh and find appropriate scriptures to pray. I later decided to start journaling the bible verses I was using, at first in no particular order. Later I started to categorize them. After several years of doing this, I began to sense the Lord leading me to share these scriptures with others because there are many people struggling to pray, or know what scriptures to use in prayers. Some don’t even know they can or need to pray the scriptures. How did you decide to do what you’re doing today, that is, become a published author? RM: First, without any doubt, the grace of God. I also reached a point where I realized no matter how much I prayed or fasted, God was not going to do my part for me, which was to start writing. I needed to start putting whatever the Lord was placing in my heart on paper. So, with that knowledge, I made a decision to get serious with my calling and do this first book that I had been working on for too long. So I set a deadline even when I had no idea how to publish or how to get a book cover done! But God is ever faithful. Once you trust Him, and take that first step, and commit to doing your part, He will begin to bring in the people, resources and even skills you need to complete the assignment he has placed in your hands. RM: Since elementary school. I used to write short sentences on paper cut into little squares. I would staple those together and proudly pronounce I had a book. My writing continued in high school, however my first published work was a little over 20 years ago when I wrote an article for my local church magazine. Can you describe a typical day in your life where you are able to fit writing into it? RM: My typical day is very busy. Presently I work full time, and I’m a wife and mother of three little kids 🙂 However, the Lord taught me to use what used to be a concern/pain to my advantage. I travel long hours to and from work; and fortunately I get to take the train. So these are the hours I do my writings the most — while commuting to and from work. I also try waking early Saturdays before my kids, so I can spend some hours writing. What do you enjoy most about what you do as an author? RM: Seeing lives transformed, and people re-committing to spend time with their Maker. I’m also blessed when I hear testimonies of people arising to take their rightful place in Christ and living victorious Christian lives. I also, obviously, enjoy writing. When I write, I experience joy and peace. I feel deep satisfaction; and right then forget about any current issues that should have been a concern. It’s like being translated from the present to the heart of God. RM: Definitely the bible takes first place 🙂 I love reading that Book; and the Author is my Father:) I just enjoy God’s word. It’s ever fresh, ever relevant, ever powerful! I read books by different authors that I really love; but early in my life as a believer, I really enjoyed reading Max Lucado’s books, when it comes to getting an assurance of God’s love for me, and His total acceptance of me. I also enjoy Yonngi Cho’s books on prayers. But all in all, I have been blessed to have been under the teachings of several anointed men and women of God either directly or indirectly; and these have been used by the Holy Spirit to shape (and still shaping) my life. Can you share something that people might be surprised to learn about you? RM: I love to crochet, and have done so since I was very little. What do you expect your readers to gain from reading your books? RM: I want my readers to cease being defeated in life! I want them to know that they have help in God through His Word, and that His Word is most reliable. In addition, I want them to experience how to turn scriptures into prayers, and help them to actually pray those scriptures through the sample prayers and faith declarations provided. I also want them to know that the Word covers EVERY situation in their lives. No matter what it is, God’s got it covered! That is what the book “SCRIPTURE WORKS!” is about. If you are working on any new book projects can you give us a sneak-peek? RM: Yes. 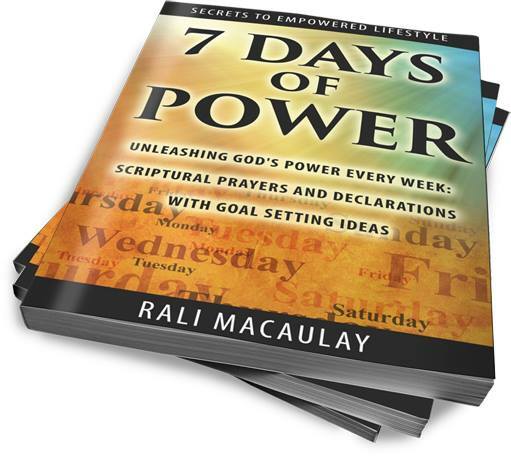 I am currently working on a series entitled “Secrets to Empowered Lifestyle.” I recently published the first book in the series “7 Days of Power.” The purpose of this book is to provide a daily devotional for the week, with scriptural prayers/faith declarations. It also includes a bonus section on goals because “…faith without works is dead…” –James 2:17. Thank you Rali for being my guest author here at Pray What God Says. I hope you will continue to stand by your motto and that is to inspire others to live fulfilled, empowered, and victorious lives in Christ — so they will be enabled to know and walk in God’s plans. Speak the language of Kingdom and shift from victim to victorious. When you do, prepare to enter into God’s tangible presence where your heart will readily commit to His love, power, peace and blessings. The effect of communion and fellowship with God yields the manifestation of spiritual growth and blessing in every facet of your life.